The Biblical Counseling Keys from Hope For The Heart, a biblical counseling ministry, are based on the fundamental truths of the Word of God. After years of Bible study, research and counseling experience, Hope For The Heart founder June Hunt has developed this immensely practical material on 100 pertinent topics. Written with logic and compassion, the subject matter ranges from the hopelessness of suicidal thinking, the mysteries of anorexia and bulimia, and the atrocity of child abuse, to the more universal topics of grief and guilt, marriage and parenting, alcoholism and anger, depression and divorce, temptation and trials. In each of the 100 topics, some providing up to 40 pages of content, June applies God’s truth to provide in-depth and practical help for today’s individuals and families. The application of psychology has long been debated in Christian communities. Finally, with the Baker Encyclopedia of Psychology and Counseling, there is a dependable source of information for every facet of contemporary psychology, from theory to practice. Numerous contributors writing on their areas of expertise from a Christian perspective make this a must-have resource for pastors, counselors, and Christian psychologists. The Baker Encyclopedia of Psychology and Counseling was born out of the need for a comprehensive treatment of psychology from a Christian point of view. The rapidly expanding body of knowledge in psychology has led to the publication of a number of encyclopedias in recent years, each written from one viewpoint or more -- usually from several. This work is unique in its Christian perspective which identifies the issues and applications and suggests ways of evaluating current concepts, theories, and research findings in light of biblical teachings. 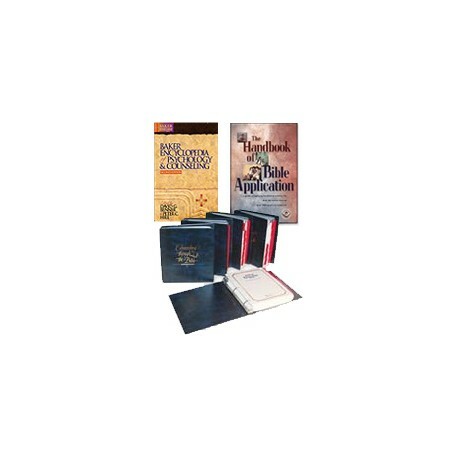 The Handbook of Bible Application arranges the application materials of the best-selling Life Application Study Bible into hundreds of contemporary categories. The topics are presented alphabetically and cross-referenced to related topics, key Bible verses, and longer Bible readings, with each entry specifically designed to address life’s everyday struggles and questions. And each topic leads you directly to the Bible passages that speak to those issues. Whether you're preparing a sermon or a lesson, or simply studying on your own, you'll enjoy this comprehensive resource of answers to contemporary questions!